We have earned accolades in the domain of manufacture, supply and trade of Steel Strapping Tools. 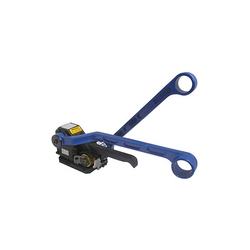 The range includes Manual Clutters and Sealless Combination Tools. These tools are made from the best quality stainless steel accredited from our trustworthy and certified industry vendors. This is a sealless steel strapping Tool for High tensile steel straps.This is a combination tool for both tensioning,sealing and cutting.This is a North Amercan Comapany,(Canada make).This is patented tool.As of now nobody having this tool.We have different models of Tool for different size of steel straps. Looking for Steel Strapping Tools ?